The study of historical natural phenomena has always suffered from a lack of pictures. 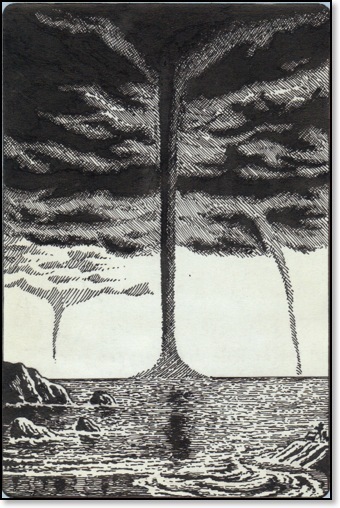 The Southwold waterspout of 1884, for example, amazed the witnesses with its grandeur during the few minutes it was visible. Then it was gone without trace, and the only record of its existence was a letter to the Times. 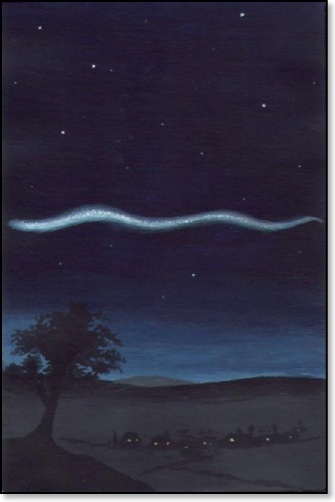 I have attempted to recreate what some of these lost phenomena might have looked like, using descriptions by witnesses and sometimes their drawings. 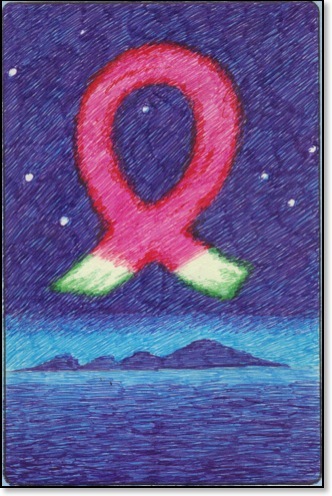 While a rough sketch by an eye-witness is more valuable than any 'artist's impression', often we don't even have that. Accuracy has been striven for, but cannot be guaranteed, of course. 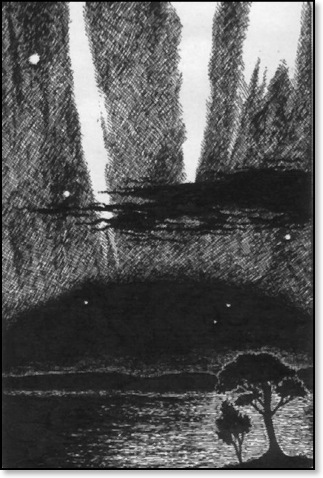 THE TRAIL OF THE GREAT PASAMONTE METEOR, as seen from Wagon Mound, New Mexico, 5:04 a.m., 1933 March 24, a few minutes after the final explosion. 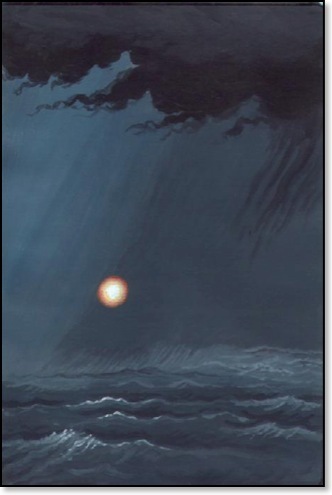 The trail, about 17 miles up, was intensely self-luminous and glowed until at least 5:30 a.m.
A PECULIAR GEOMETRICAL CLOUD seen in the Equatorial Atlantic, 1870 March 22, from the barque Lady of the Lake. The object moved against the wind until it was lost sight of at dusk. 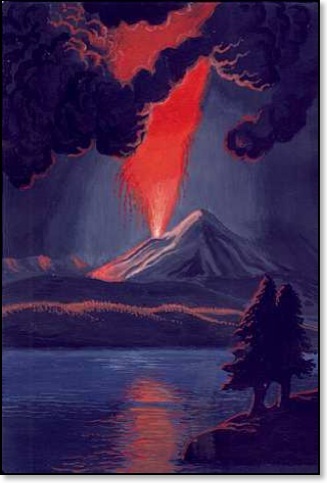 AN ERUPTION on the flank of the Cascades volcano Mount St. Helens which produced an ashfall over a wide area, 1842 December 5. 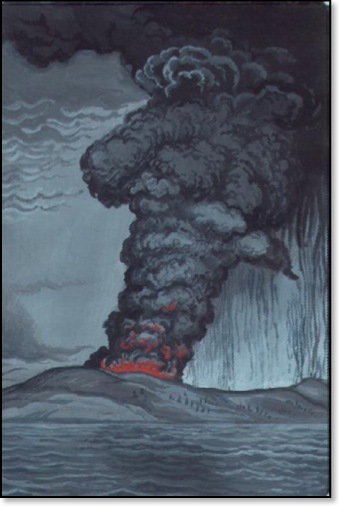 The eruption began on November 22 and continued intermittently until 1844. ALL-SKY AURORA over Nairn, Scotland, 1870 September 3. 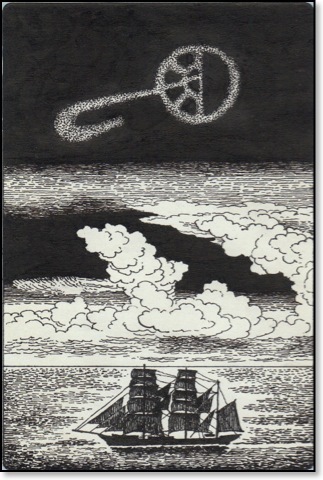 The whole sky was covered with a white, glimmering aurora, but for an arc of clear sky on the S.S.E. horizon, bisected by the magnetic meridian. ANNULAR SQUALL approaching Kano airport, Nigeria, 1947 June 12. It left a damage path 300 yards wide. 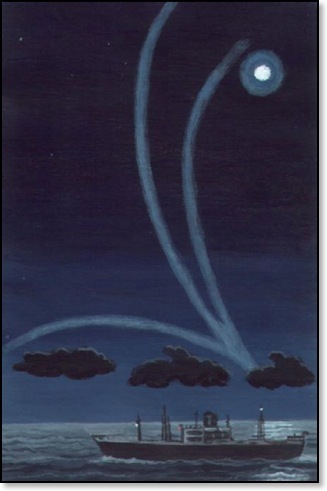 The squall cloud base showed an annular roll or ‘crater’, with strong downcurrents which swept out and up. MYSTERIOUS ARCS OF LIGHT over the North Atlantic, 1948 February 26. They were seen near the Moon from 0140 to 0220 GMT., and are believed to be an unknown type of halo phenomenon. 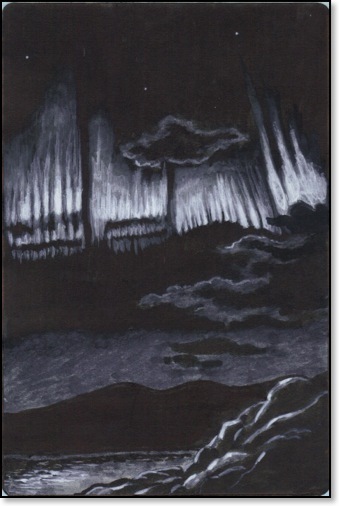 AURORA OVER CUMBERLAND, 1926 October 15. 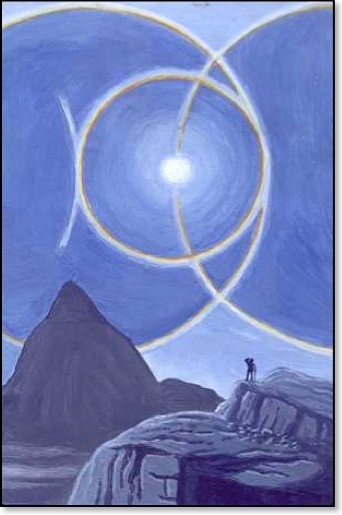 The unusual elliptical arc had its major axis vertical and centred on magnetic North. 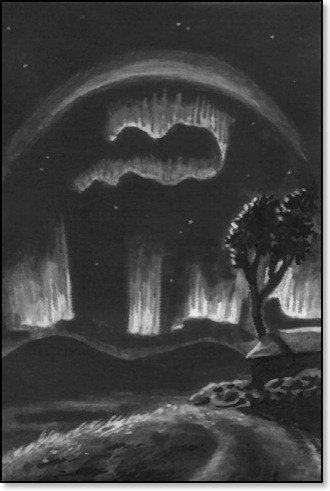 'AURORAL METEOR' seen from northern England and Ireland, about 9 p.m., 1853 September 2. It undulated across the sky from east to west. An aurora was visible at the same time from York. 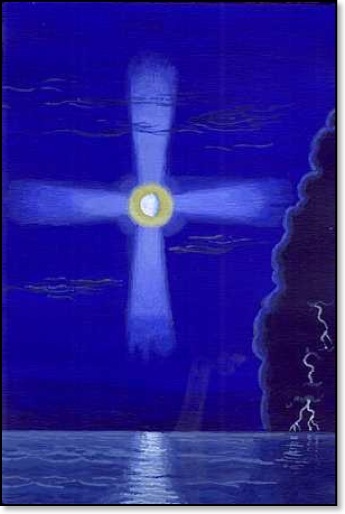 LIGHTNING BALL falling into the Mediterranean as seen from the T.S.S. Viceroy of India, 1938 December 21, during a fierce hail and rain squall. A ‘terrific clap of thunder” accompanied the ball. No other lightning was seen. 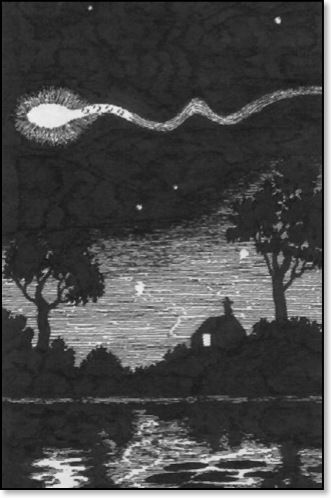 A STRANGE METEOR moves slowly across the sky of southern England in a sinuous path, 1900 July 18. 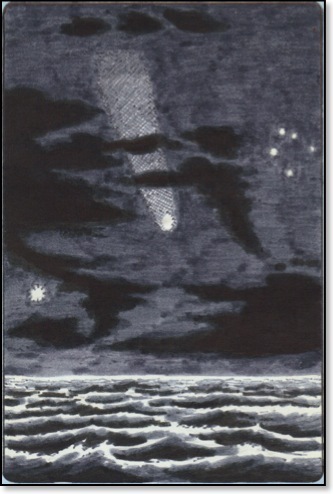 COMET 1948l as seen from the MV Brockleymoor in the South Pacific, 1900 GMT, 1948 November 9. Venus and the Southern Cross frame the comet. Perihelion 1948 October 27. HALOES OVER HERTFORDSHIRE, 1853 February 15, 12:57 p.m. A partial halo of 24 degrees encircles the Sun, with two prismatic parhelia. A contact arc touches the top of the halo; above, a circumzenithal arc. 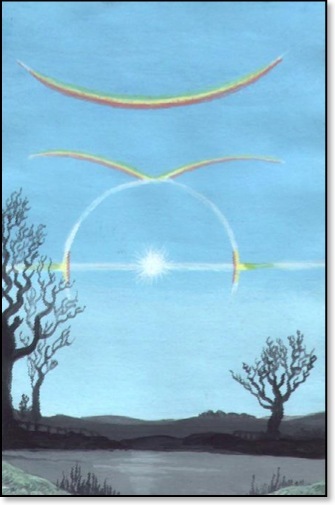 A parhelic circle passes round the horizon. 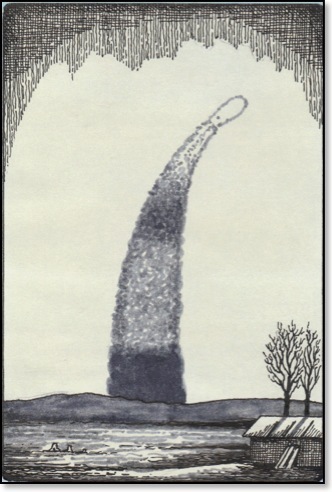 THE DUST TRAIL left by the great Sikhote Alin meteor, Eastern Siberia, 1947 February 12. 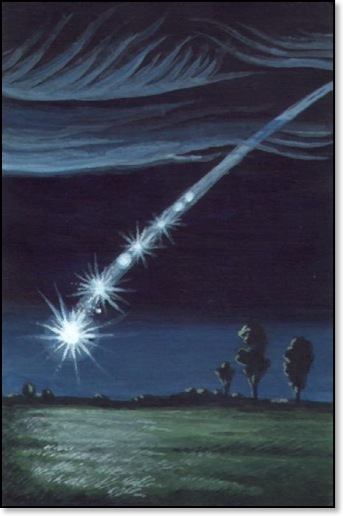 The meteor occurred at about 10:30 a.m. local time, but the trail was visible all day. About 23 tons of meteoritic material was found. ERUPTION OF KRAKATOA, 1883 May 27. 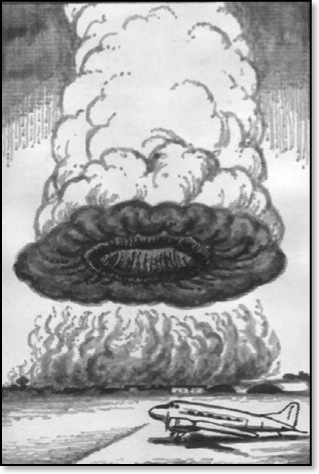 The eruption began on May 20; on August 27, after four huge explosions, the island collapsed into a submarine caldera. A LUNAR HALO of 22½º radius and an unusual arc over the North Atlantic, 0248 GMT, 1930 June 10. Both halo and arc were colourless. 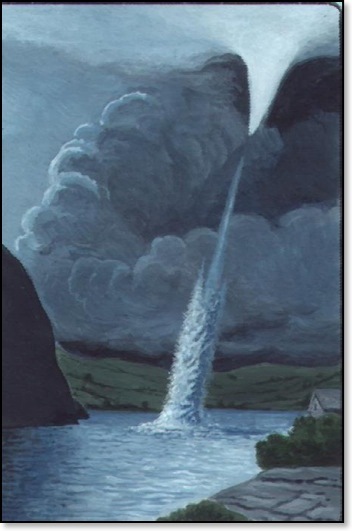 A WATERSPOUT OVER FIVE THOUSAND FEET HIGH forms in calm air off Eden, New South Wales, 11 a.m., 1898 May 16. Height 5,014 feet, width 100 feet at top and base, column 10 feet wide. 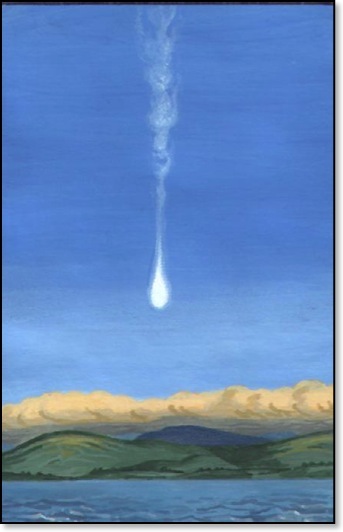 METEOR FIREBALL NEAR SUNSET, Scotland and northern England, 1900 September 2. 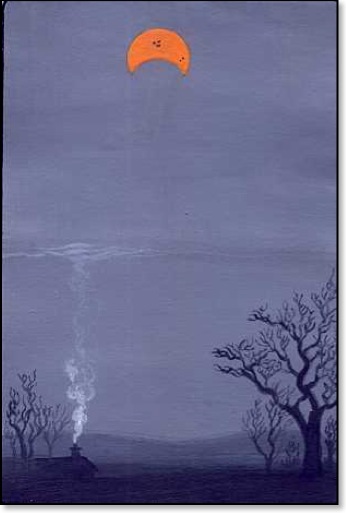 It disappeared 25 miles above Lancashire, and left a trail of white dust for some minutes. 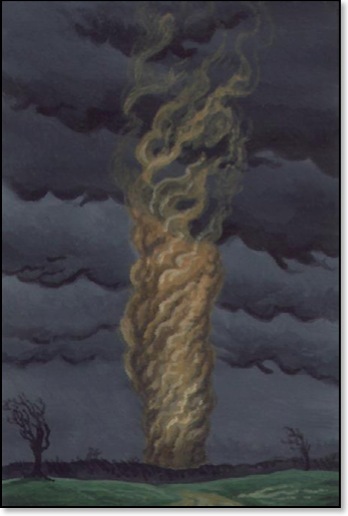 TORNADO WITHOUT A FUNNEL CLOUD near Mayfield, Ohio, about 4 p.m., 1842 February 4. A ‘huge column of a dull yellow tinge’ marked the vortex. It moved 24 miles before passing onto Lake Erie. 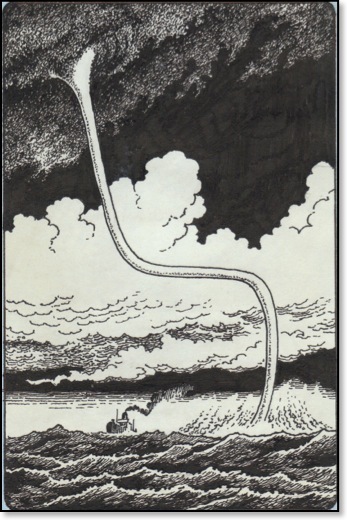 WATERSPOUT BEGINS TO WHIRL in the North Atlantic, 1938 April 25. The funnel descends into an invisible vortex touching the sea. WATERSPOUT CROSSING THE RHINE, near Konigswinter by Bonn, 1858 June 10. 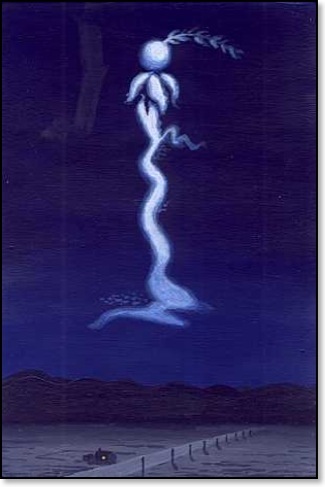 The vortex looped across the river as a waterspout. It became a tornado when it touched both banks. 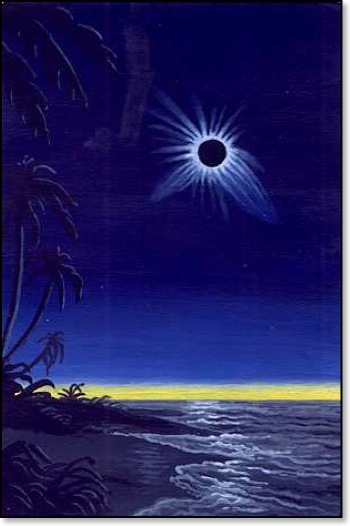 TOTAL ECLIPSE OF THE SUN over Caroline Island Atoll, 1883 May 6. Totality lasted 5 minutes and 24 seconds. The Moon’s shadow passed entirely over the Pacific Ocean. 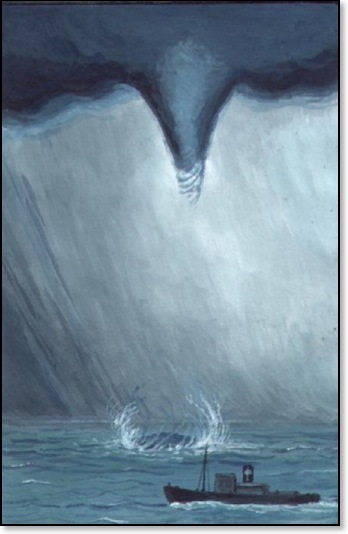 THE SS ALONDRA PASSES CLOSE TO A WATERSPOUT in the North Atlantic, 1930 July 5. The contorted column was about 900 feet long, and resembled a ‘huge steam pipe’. ECLIPSE IN A FOG, from Kilgorrif, Ballinasloe, Ireland, 1:40 p.m., 1861 December 31. 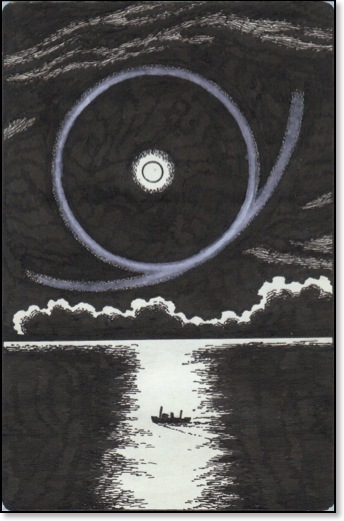 A HALO CROSS ROUND THE MOON over the North Atlantic, 0340 GMT., 1933 July 12, as seen from the S.S. Orduna. SOLAR HALO DISPLAY seen from Horntind, Norway, 1898 August 7, 1:30 a.m., at 4,000 feet. A halo of about 22 degrees encircles the Sun, interlinked with two complete circles of about 44 degrees radius.